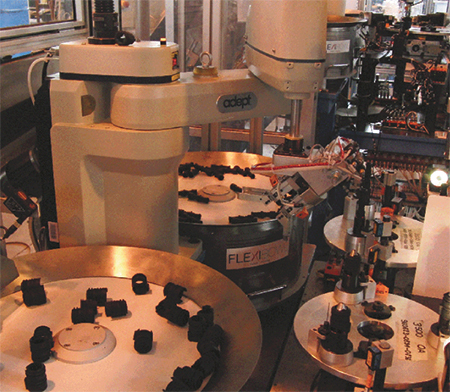 Adept Technology, Inc., Pleasanton, CA, a provider of high-speed industrial automation products for manufacturing, packaging, material handling and factory automation, introduces the FlexiBowl, an innovative vision-based robotic part- feeding solution available as an option on all Adept robot systems. The Adept FlexiBowl employs circular band tracking to simplify and speed the robotic acquisition of component parts used in assembly, handling and kitting applications. The unit can quickly separate and orient a variety of parts made from diverse materials including plastic, metal, rubber and silicone.